Walnuts are a source of vegetable protein, as well as vitamins, minerals that are good for our health. Research shows that walnuts have high levels of antioxidants two times more than other beans. Unfortunately not many people who eat them. Walnuts are one type of nuts that has tremendous benefits. The content of alpha-linolenic acid, which is part of the omega 3 can reduce the risk of coronary heart disease. This delicious nut you can eat as a snack. You can also mix in your breakfast oatmeal with blueberry pieces. In addition to antioxidants, walnuts are also rich in omega-3 fatty acids that increase the amount of good cholesterol in the body and get rid of bad cholesterol. Eating a handful of walnuts can make you avoid heart disease, stroke, or coronary heart disease. Walnuts are also known to be able to cope with inflammatory diseases such as asthma, psioriasis, eczema, or arthtritis. The antioxidants present in walnuts help boost the immune system and protects the body from the aging process, cancer, and neurological diseases. The content of omega-3 in walnuts also strengthen cell membranes of skin, lock in moisture and nutrients in it, which in turn helps the skin glow, and remove toxins from the skin. 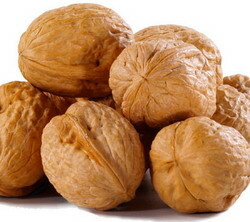 Walnuts are also able to protect the skin from dryness. Usually walnut is also used for massage therapy, aromatherapy, and cosmetic products. Pregnant women are strongly advised to consume walnuts. vitamin B complex and vitamins such as high folate, riboflavin, thiamin, and other much needed by pregnant women. Walnut contains many minerals like manganese, potassium, zinc, calcium, iron, magnesium, and copper. This mineral has many uses for the development of male sperm. Walnut can also be taken to address the problem of constipation. Eating walnuts regularly and other fat-rich foods will keep you from constipation forever. Want beautiful hair? Walnut answer. Walnut referred to as 'hair food' rich in biotin. Biotin is an essential nutrient that is needed to strengthen the hair, increase hair growth and prevent hair loss. Lack of biotin has always been associated with hair loss or fracture. You might be able to add the walnuts in your diet. These beans have a low cholesterol. It should be remembered that the walnuts are also high in calories that can not be consumed continuously. Make sure that only adds about 1.5 ounces on your diet.